Last post I gave a hint about the next project I was starting to work on and the following is an update on how that project is going. 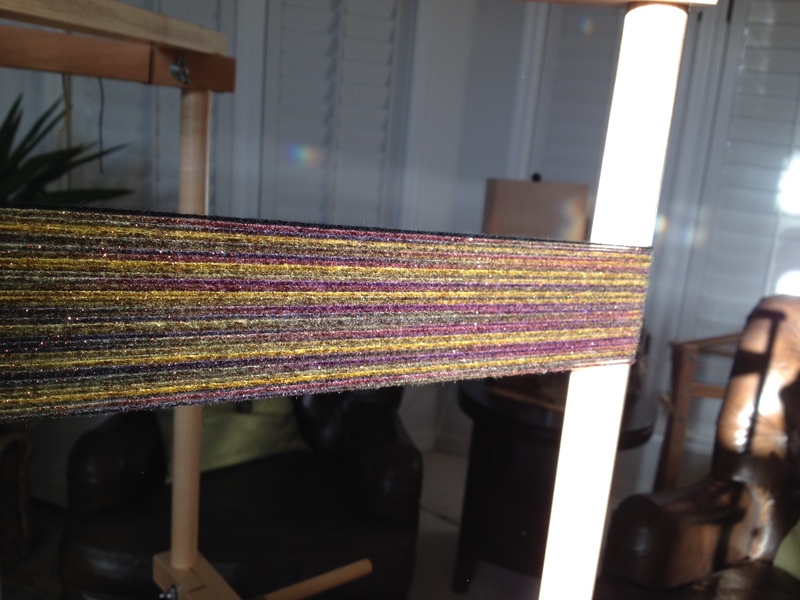 I started out with this gorgeous hand dyed warp thread I got from Robinjedmundson on Etsy. 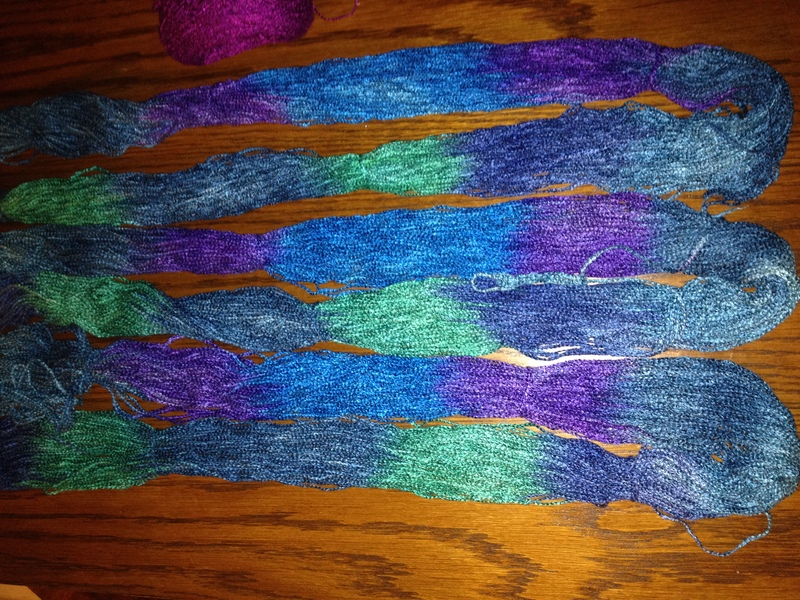 I decided it would be cool to make a purse using this colorful rayon warp by combining it with a cotton weft. 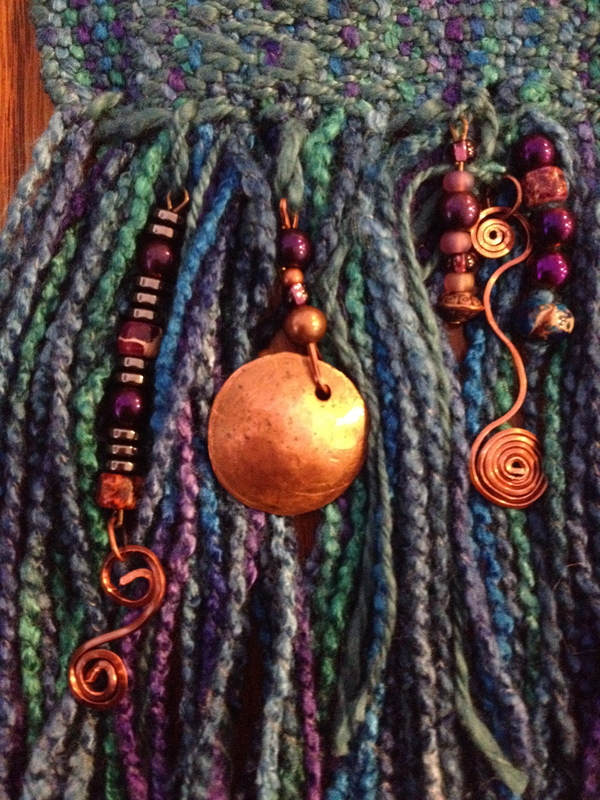 For the weft I used a mercerized cotton flake yarn. 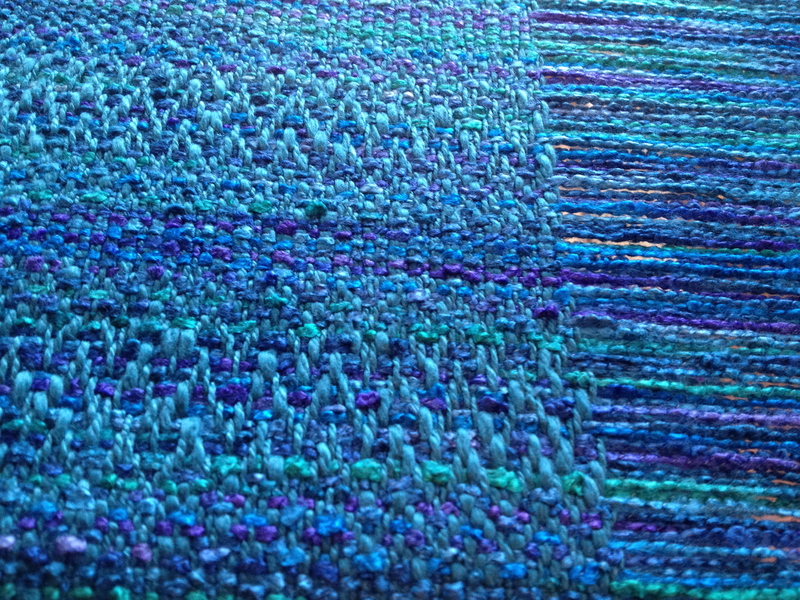 I felt that this combination of fibers would give the cloth enough body to make a purse. 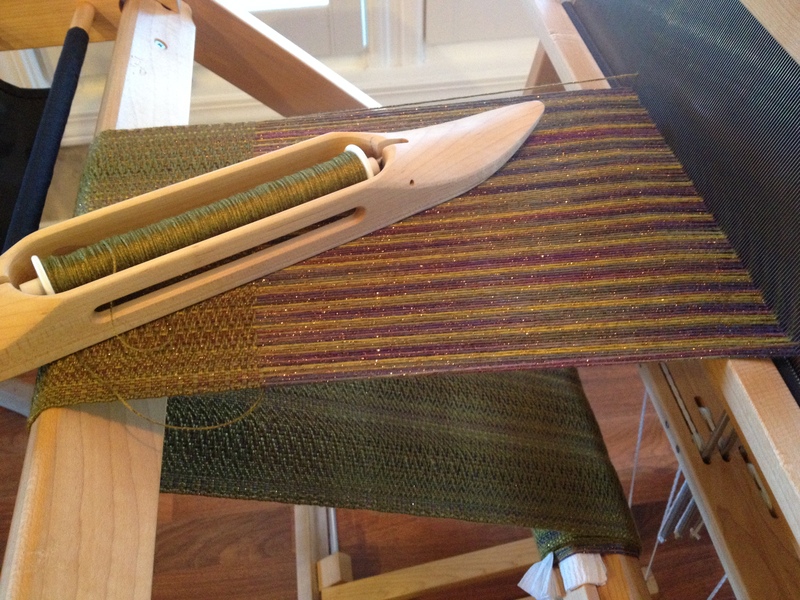 I warped up the loom with a combined twill pattern using a 15 dent reed. 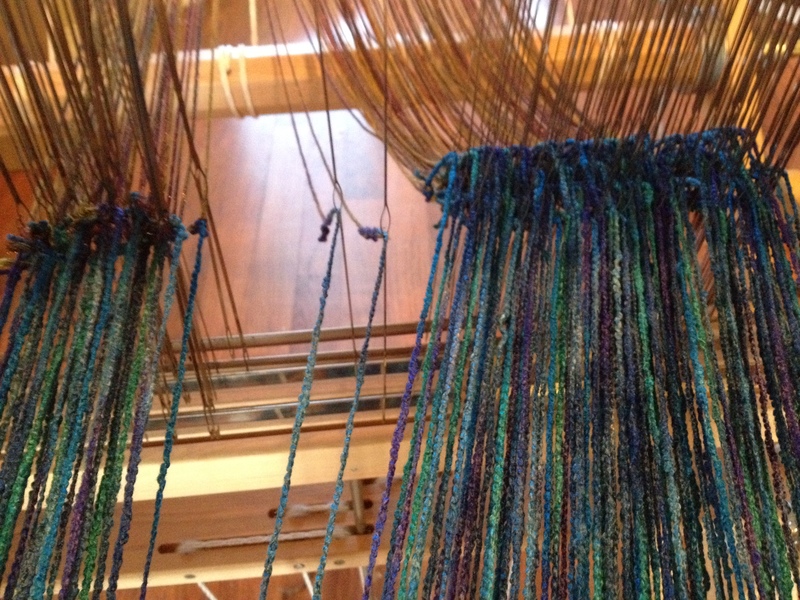 The loom was warped with 130 threads (this included the 2 float threads). 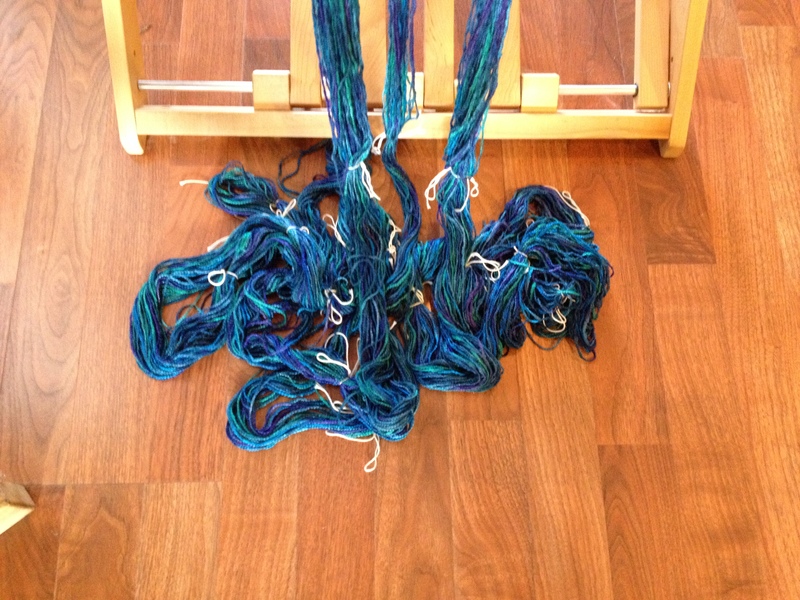 I just tied the new warp onto the old warp and pulled the threads through the reed and through the heddles instead of having to thread all of them from scratch. This process saves lots of time if you are making the same pattern several times but want to do different colors. 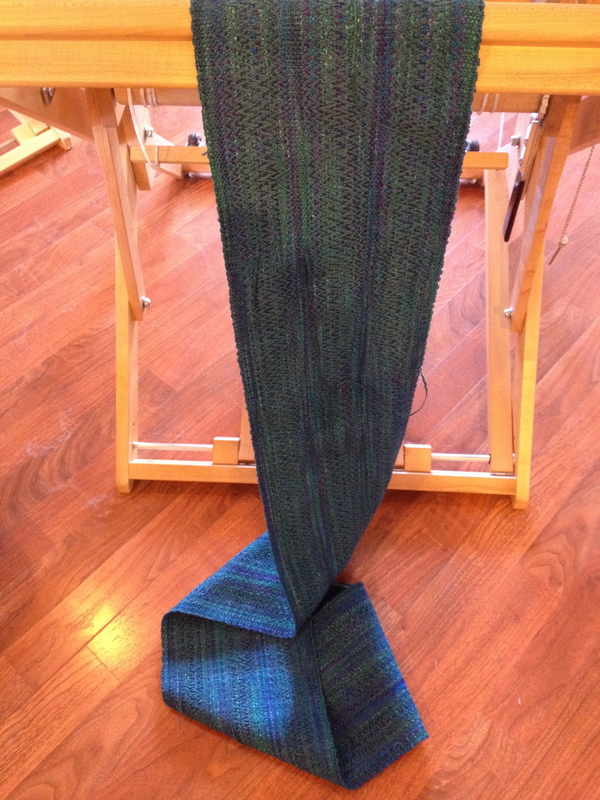 I wove using a mercerized cotton flake yarn in a dark teal color for the weft. 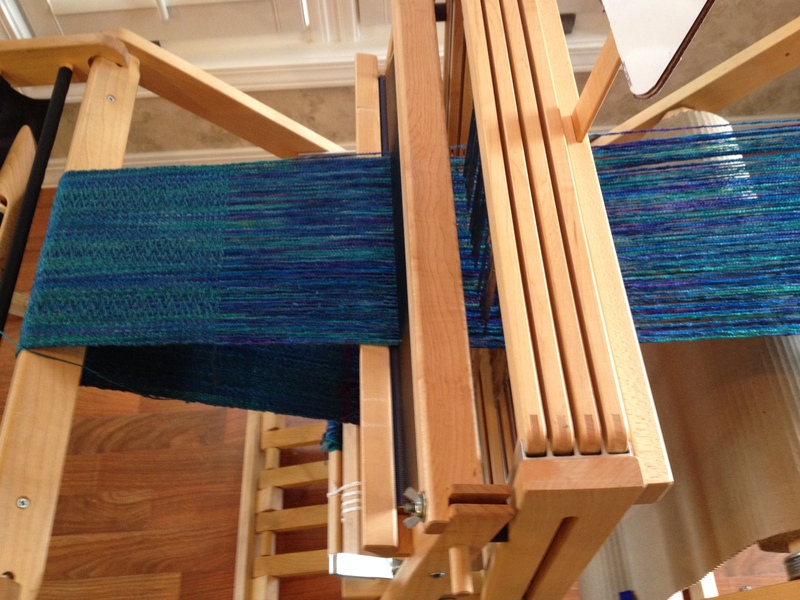 I really love the play of colors in this dyed warp combined with the dark teal weft. Here is a close up picture of the interplay of colors in the pattern. 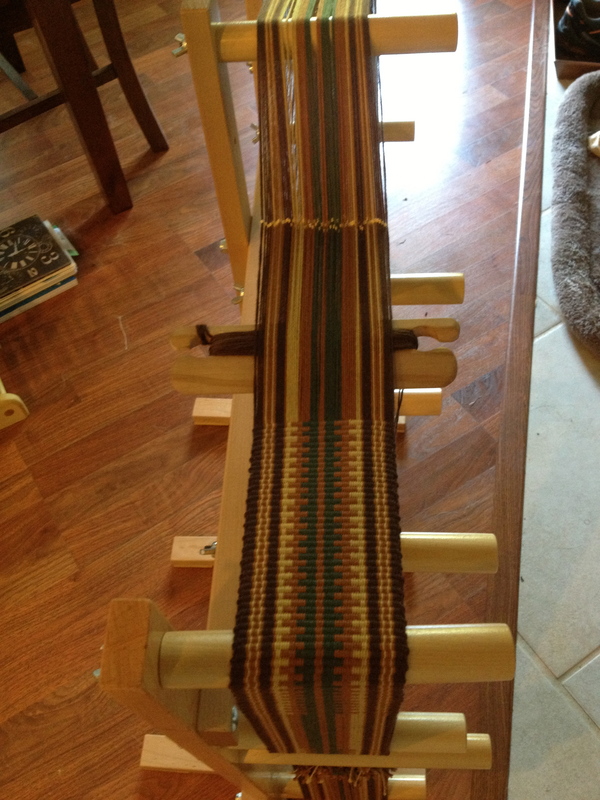 The Weaving progressed very nicely, and the fibers were a joy to work with. 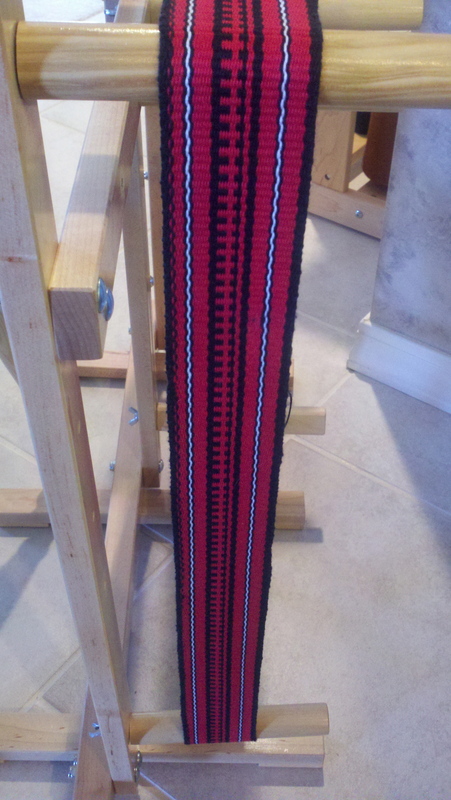 The colors did not show up very well in this picture but this is the piece as it was being taken off the loom. And this is the piece laid out before finishing. 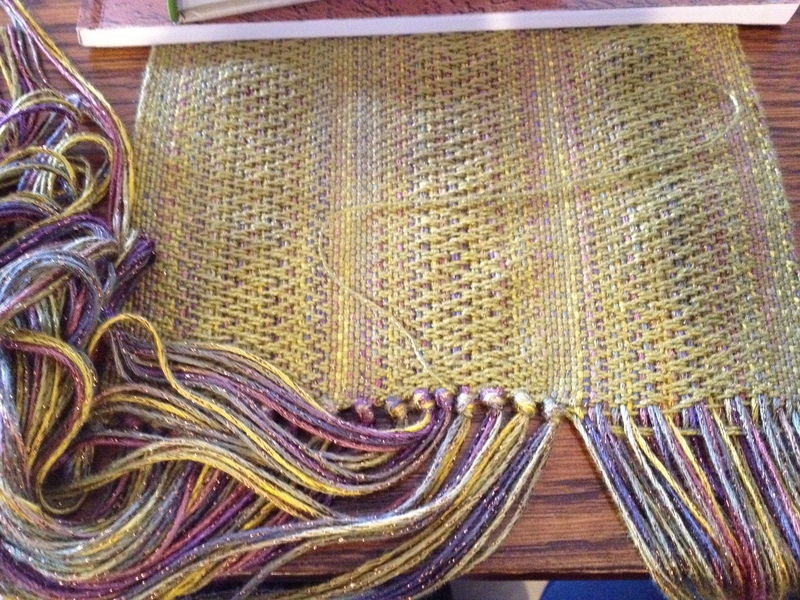 Once I did the finishing wash, dry and cutting off of the spliced in weaving tails, the finished cloth measured about 7 inches wide, and 64 inches long. I cut the fringe on one end 4 inches long and at the other end I cut it 9 inches long. The end of the cloth that has the shorter fringe will be the top flap of the purse, and the longer fringe will be at the bottom of the purse. I decided to add some copper and beading embellishments to the shorter fringe that will be on the top front flap of the purse. First I strung some beads and added them. 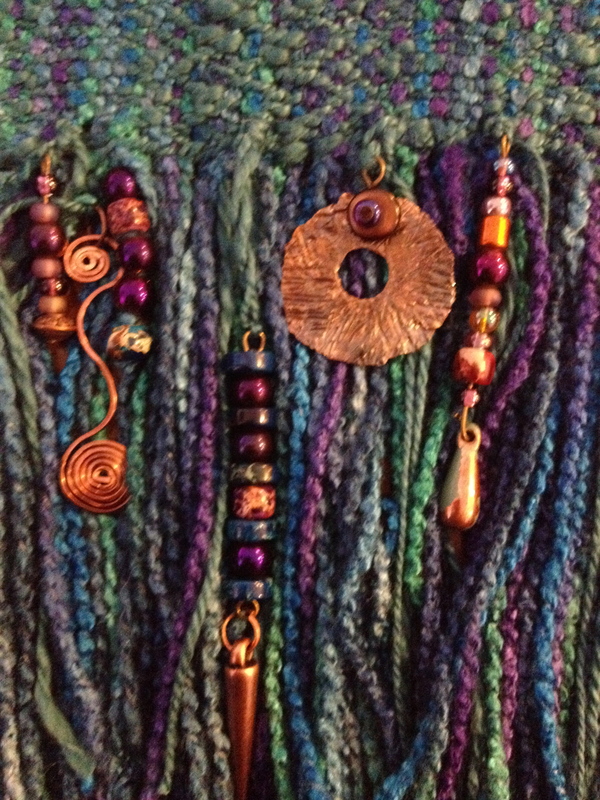 domed another and added more copper accents by twisting some copper wires and flattening them. Using this purple perle cotton, I thought I would add these beads by sewing the thread in and out of the fabric so that it shows through on top while tacking down the beads at the same time. 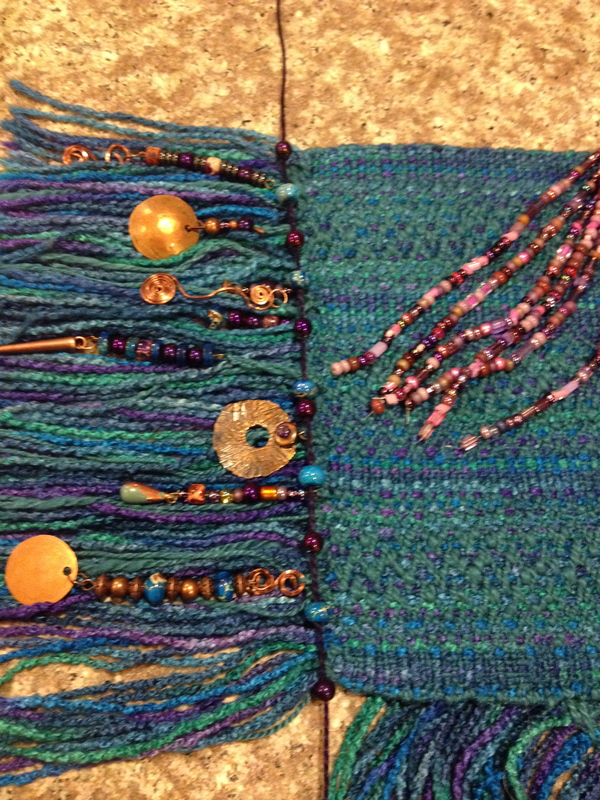 I also though I would use some of these purple beads (right side of the picture) to add a few more strands of purple accents in 2 or 3 other places along the fringe. I feel the purse is progressing nicely and I have several ideas already on how I want to piece it together. I don’t have very much of the warp thread left, but there is enough to add some into the inkle band that I am going to weave for the purse strap. 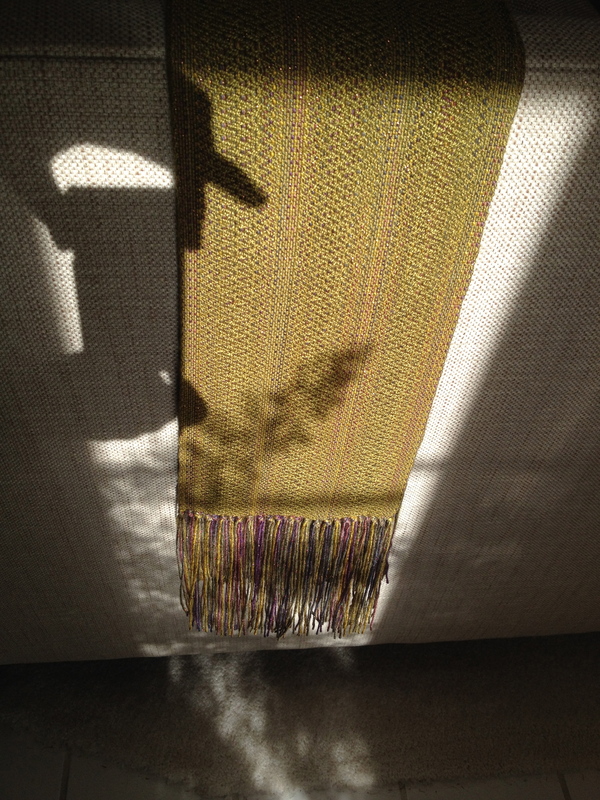 ….So for now, it’s back to the loom…. Thanks for dropping in, hope this project inspires you to make something beautiful today!! 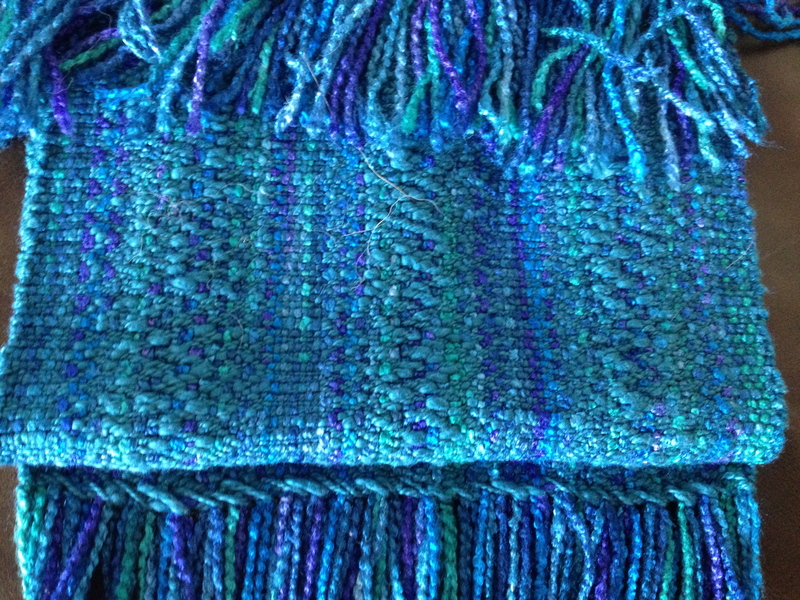 Do you remember that beautiful shimmering warp I posted about last week? 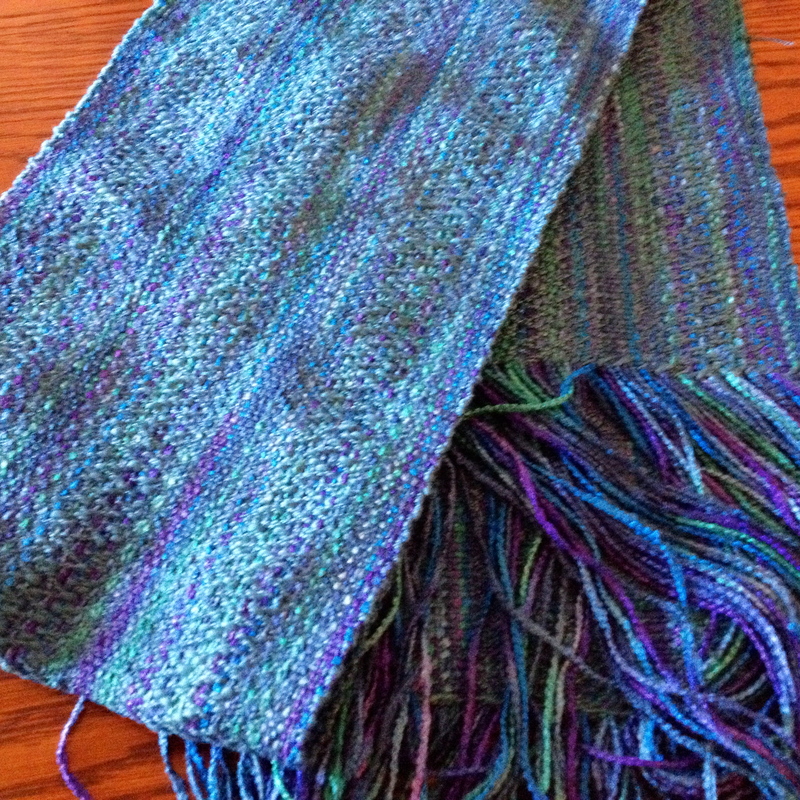 Well, it just turned into an even more beautiful shimmering scarf !! 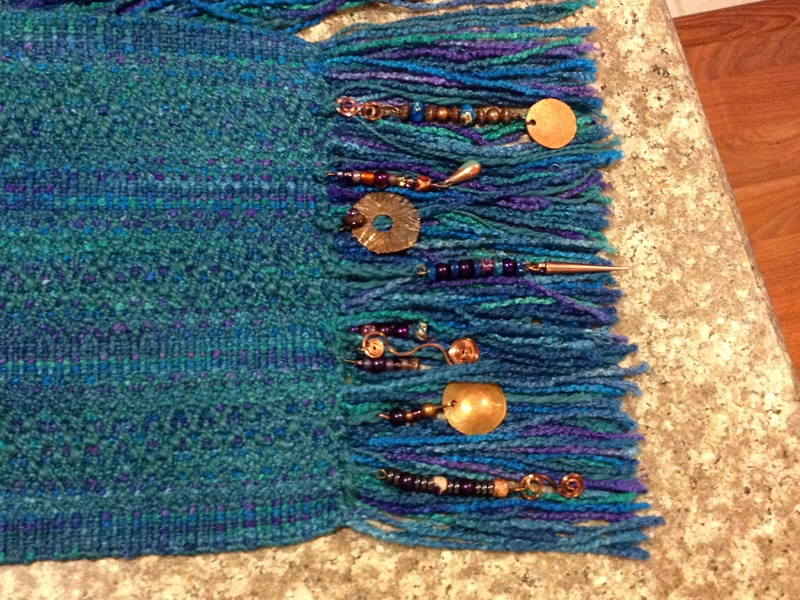 This is the finished scarf. 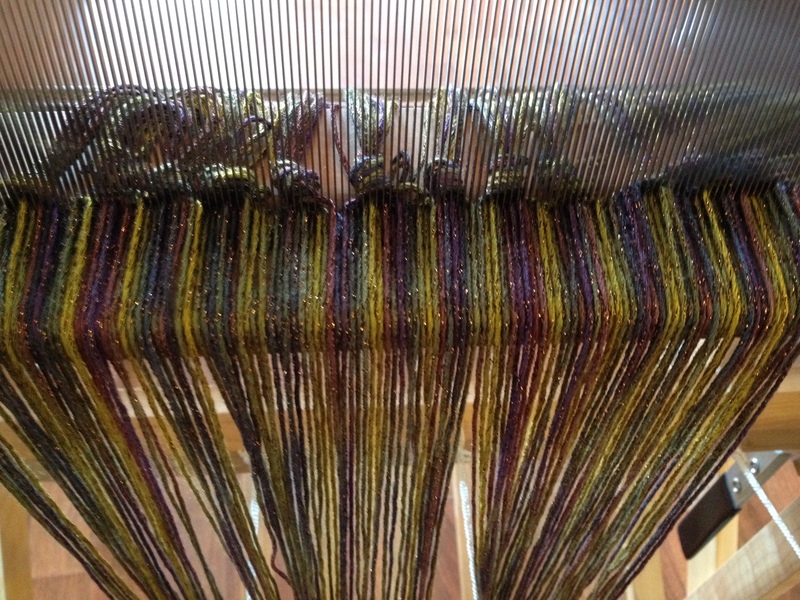 I thought you might like to see some pictures of the scarf being woven so here are a few. 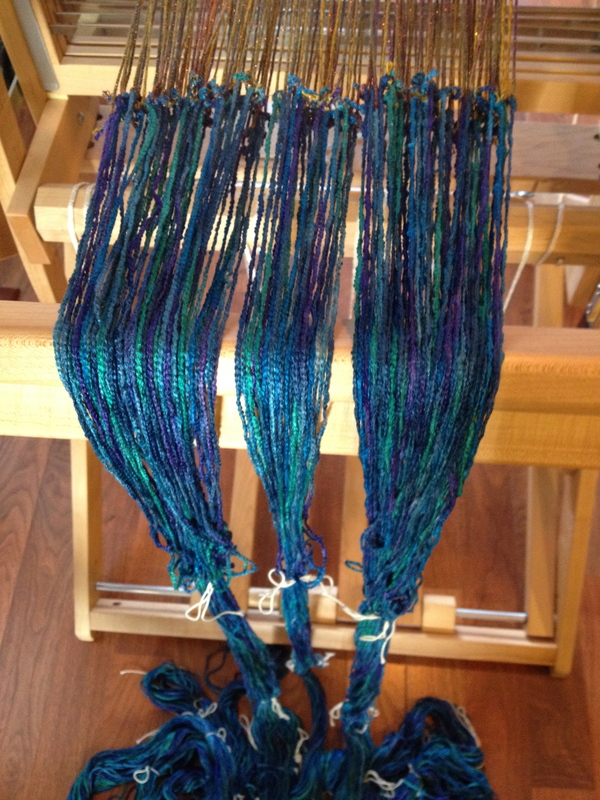 After I added the warp to the loom then the weaving process began…. 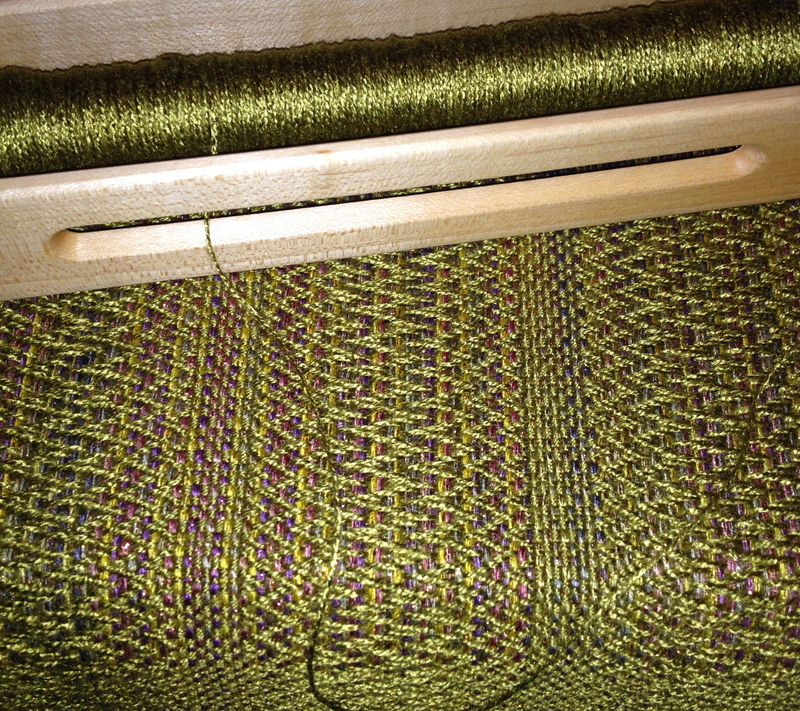 …and the twill pattern began to show through the woven threads. 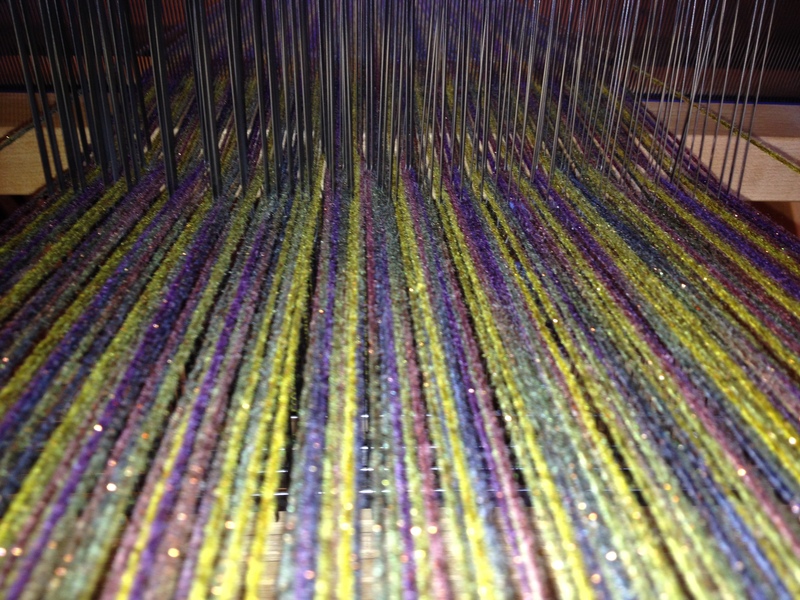 This picture shows the texture of the twill weaving. I love how this zig zagging textured twill pattern looks intermixed with the bands of plain weave. 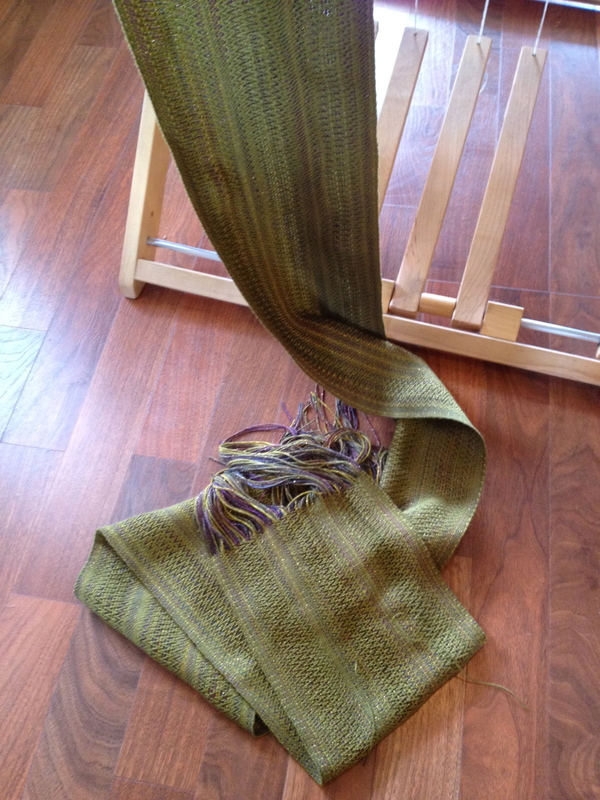 Time to cut the woven scarf off the loom and start the finishing process. 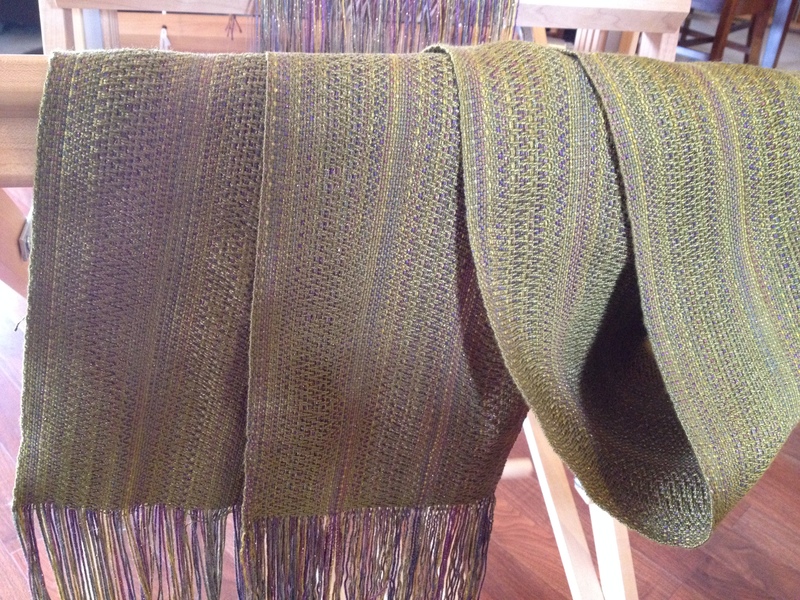 I wove the scarf about 98 inches long but as expected it did shrink a little in the finishing wash. 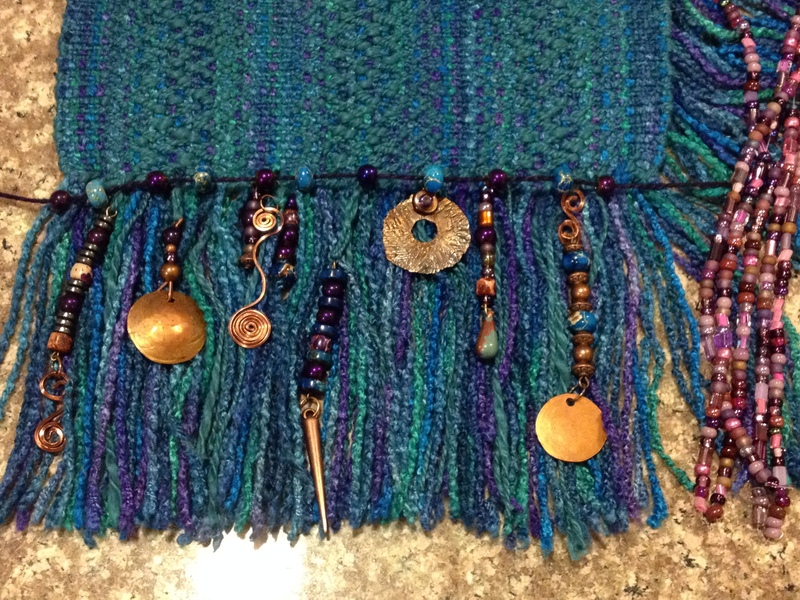 But before I washed it I tied the fringe at each end of the scarf. This is how the scarf looked after it was washed, air dried, then fluffed in the dryer. It has a very fluid and silky drape. 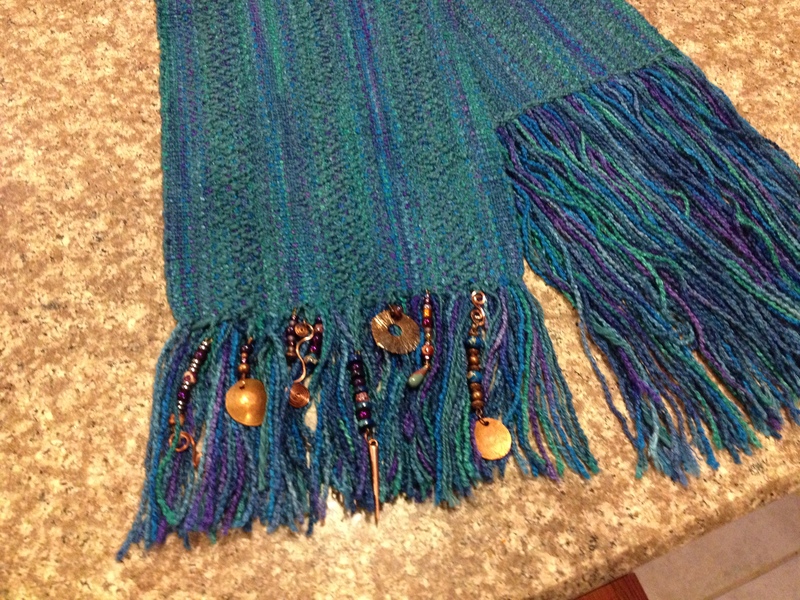 I love how my shimmering scarf turned out! 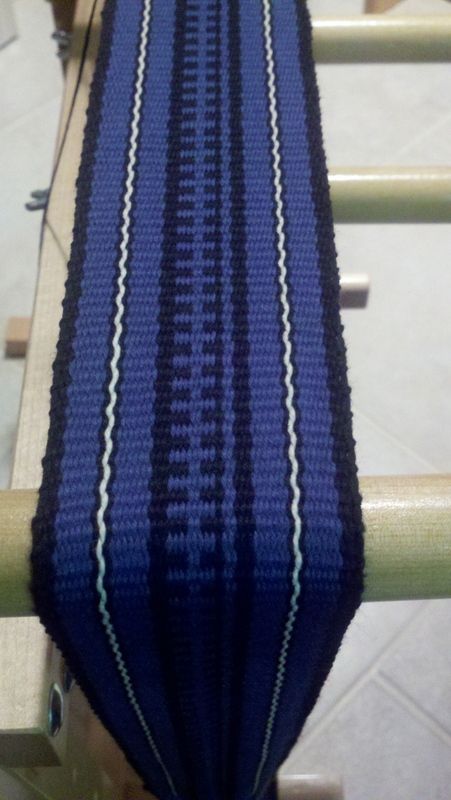 Here is a sneak peek at my next project going on the loom. 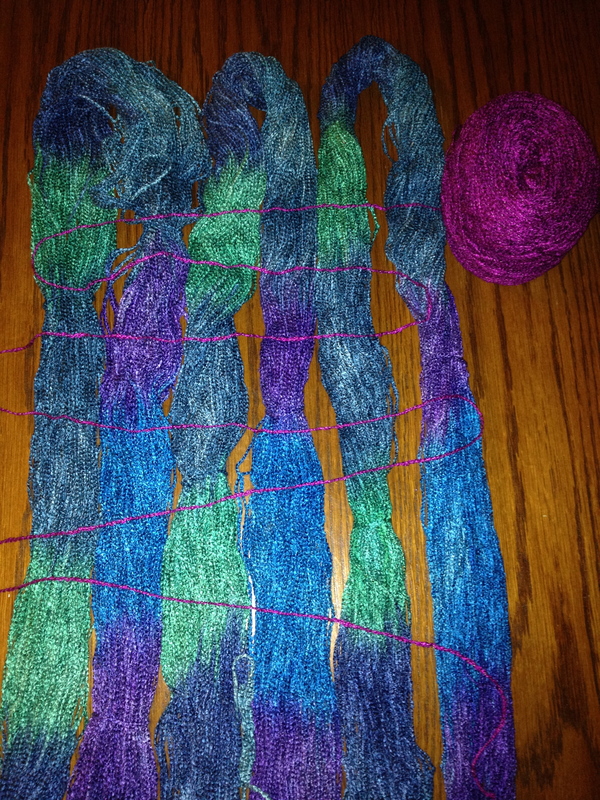 I will be using these beautiful hand dyed skeins of rayon yarn to make another twill patterned scarf. 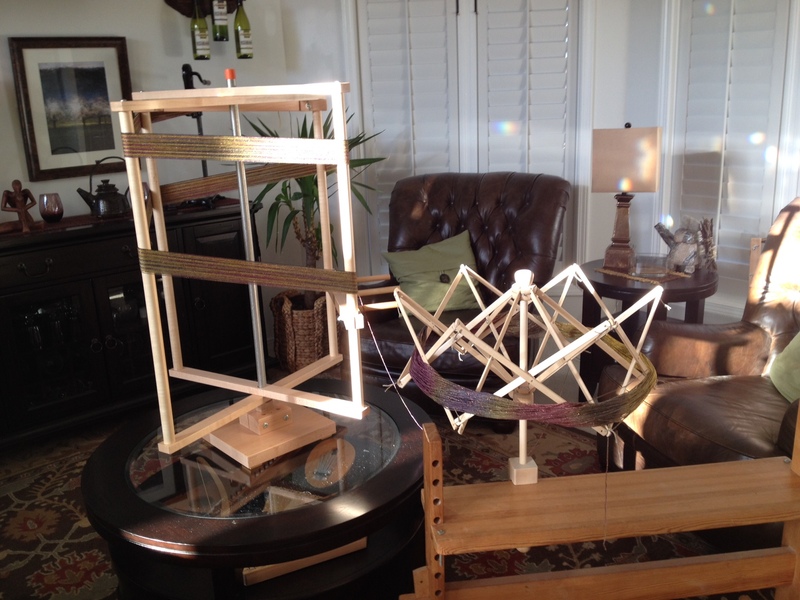 Guess it’s time to get back to the loom and warp up another project ! 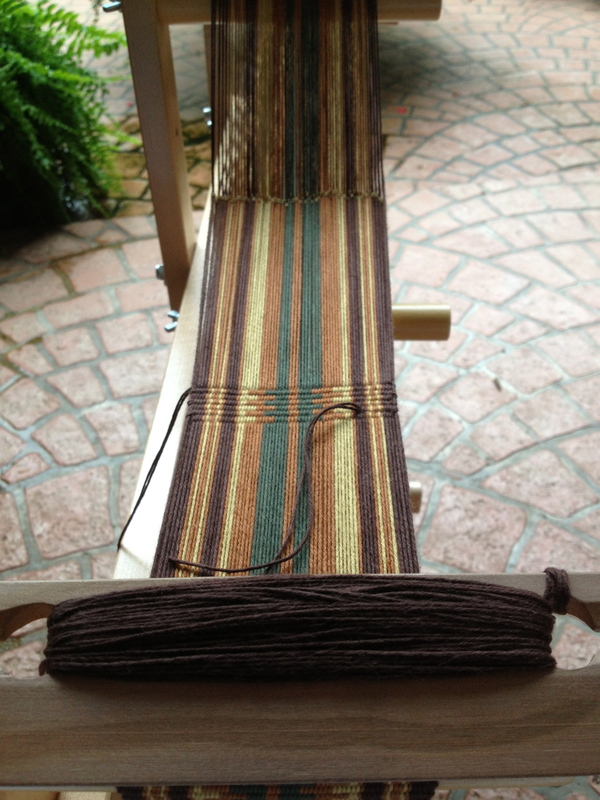 Late last fall I started warping up this Inkle Floor Loom to make an earthy colored guitar strap for a friend. 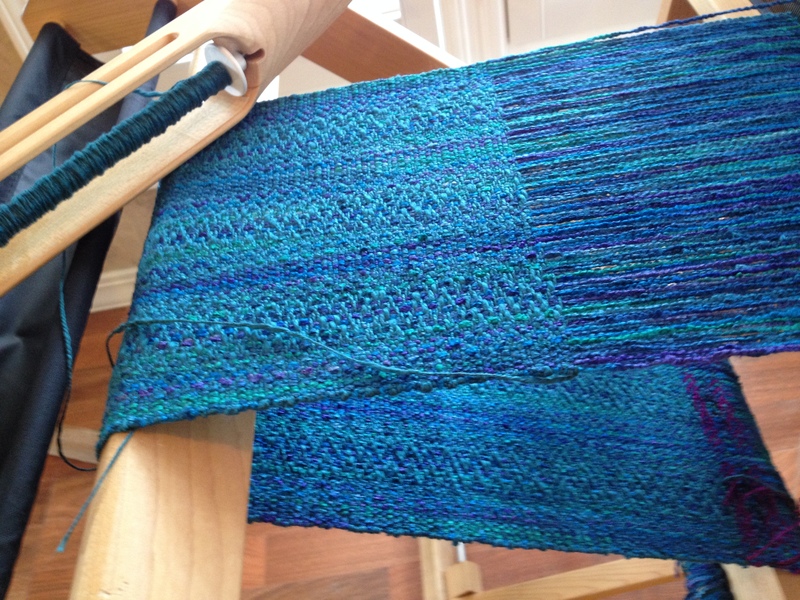 I hate to admit, it is still very much in the beginning stages of weaving. 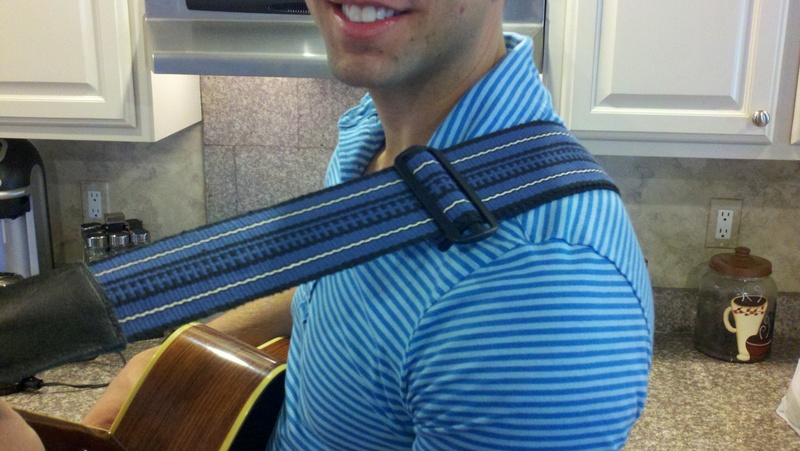 Last fall I made about 10 table runners in an overshot pattern for Christmas gifts and pretty much “forgot” about this guitar strap. Hopefully I will get a chance to get back to this project and finish up. 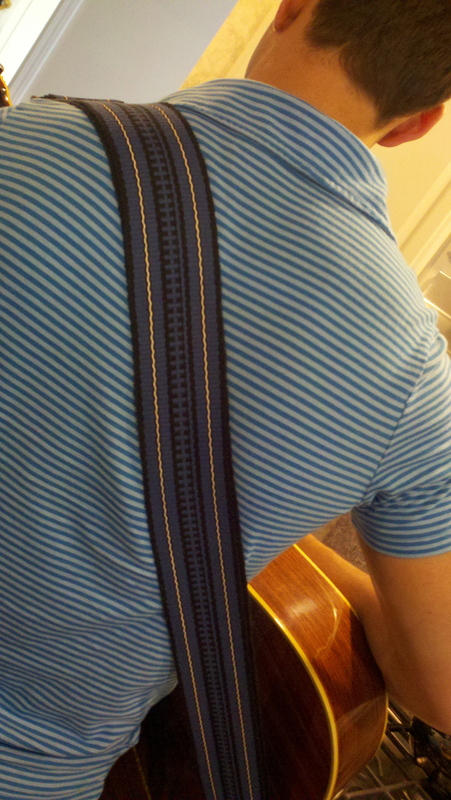 Especially when you see from the pictures below the results of my last two guitar straps I did get finished for gifting…..
……hope this inspires you to make something beautiful today! a plus in itself considering this is the middle of February! 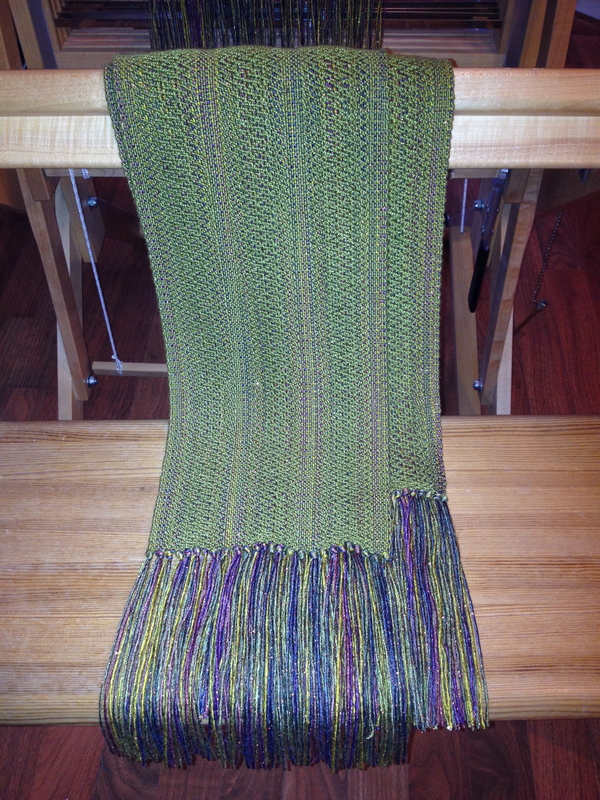 Winding the warp for this scarf has been pure JOY !! 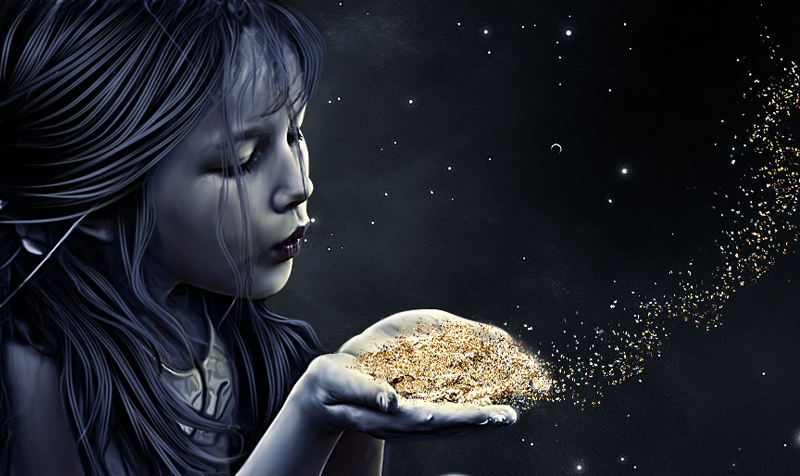 literally dance like little fairy dust across the warp. all night long to make the gleaming golden threads. May your days be filled with JOY !! BRINGING A NEW ‘BABY’ HOME SATURDAY!! 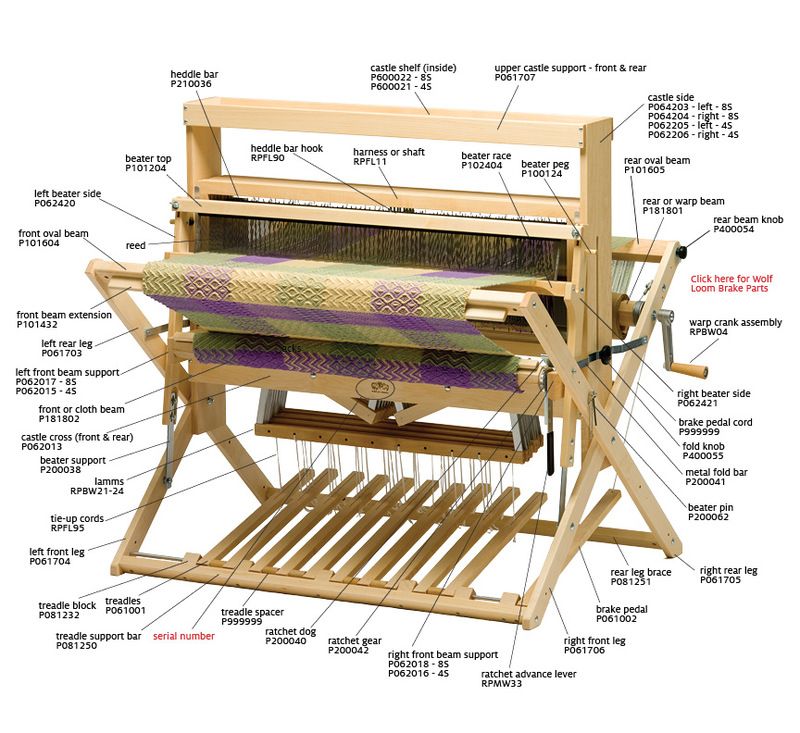 Just ordered my new loom and will be picking it up on Saturday!! 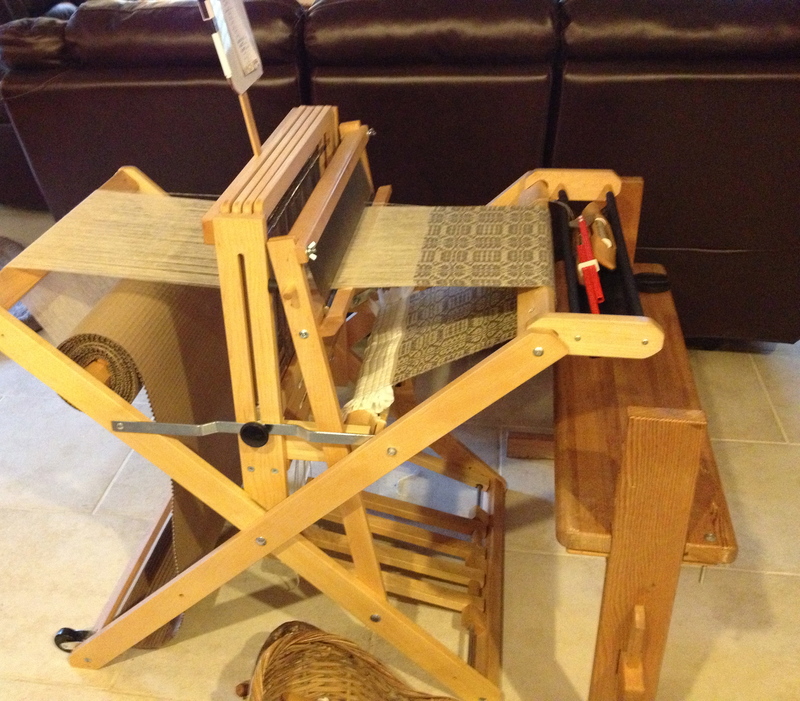 I purchased the 36″ Mighty Wolf by Schacht, an 8 harness, 10 treadle Floor Loom. As I researched this loom I was quite impressed by the features. The treadles are not a direct tie up style. There are slots in the wood of each treadle so that you just slide the tie up cords into the desired treadle slot to “tie it up” to that particular shaft (harness). So easy! 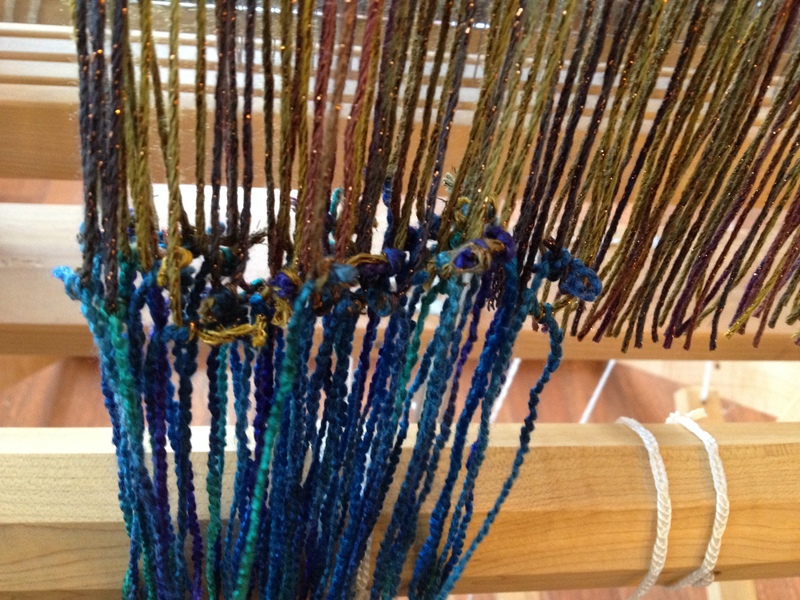 Another feature I though would be great is that each of the heddle shafts can be completely lifted out of the loom to add in or take out extra heddles. 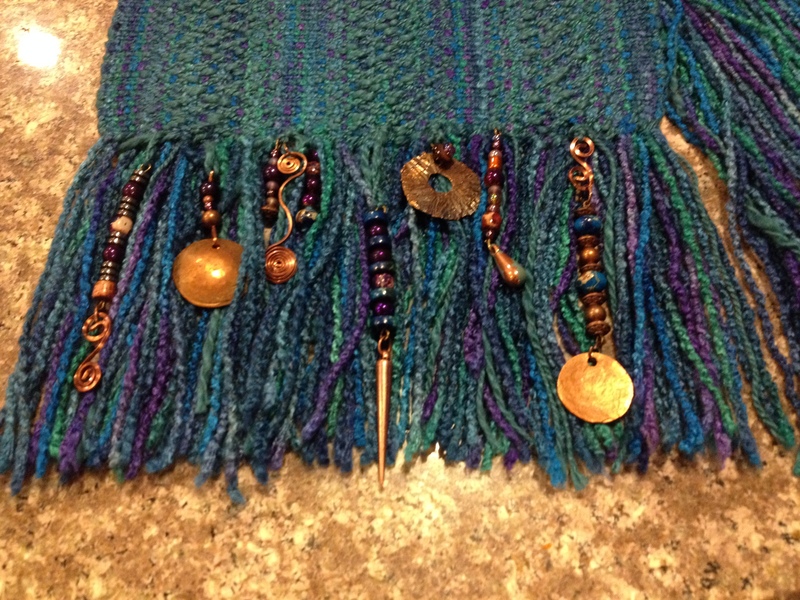 It can be laid on the table to work on, so no more finagling with the bars while the shafts are on the loom and consequently dropping heddles on the floor or worse, realizing you have missed threading one of the heddle bottoms after you have finished putting them on. Of course, that always ends up being the 50th heddle out of the hundred that you have put on, way back in the middle of the shaft! Hate to admit it but, yes, that has happened to me a couple of times with the Wolf Pup loom. 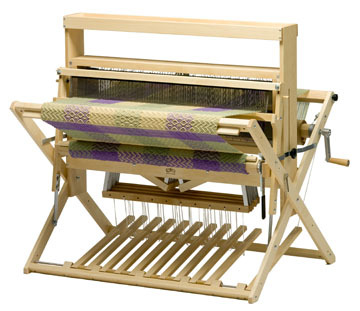 I already own the Wolf Pup, 4 harness, 4 treadle, 18″ loom by Schacht (pictured above). It has been a great little workhorse, but I am looking forward to the ability to do more complicated patterns with the 8 harness model and the much wider 36″ loom. 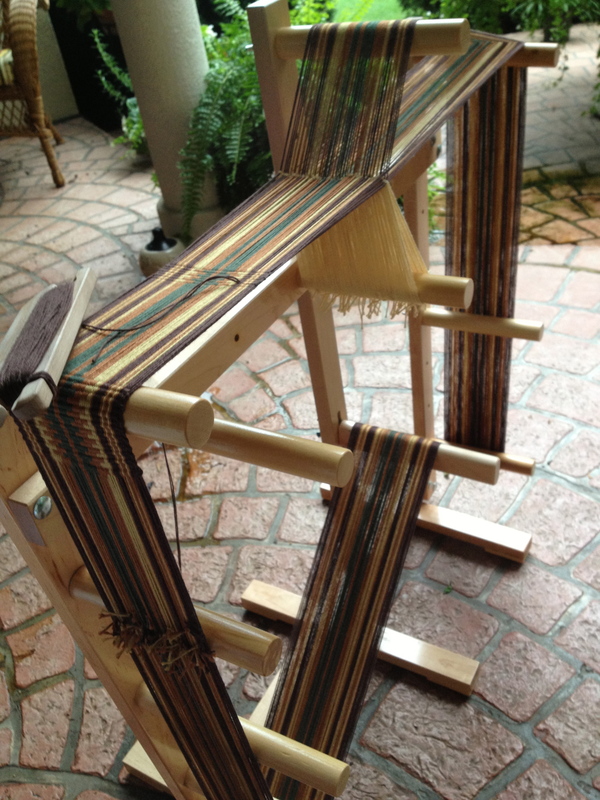 Like the Wolf Pup the new loom has the ability to be folded up for storage with or without a warp on the loom. For anyone that has limited space for their equipment this is a great feature. New pics to follow soon…..
until then I wish you Peace………. "been in trouble ever since I set my suitcase down..."
Andrew's, Bethany's, and Cat's (ABC) 365 Project. We completed it in 2010 and now want to reintroduce the focus it brought to us.